Van Gogh began working with sunflowers as a way to distinguish his style from other artists. Through his career in Paris and Arles, he created numerous sunflower paintings. With utmost reverence for one of Holland’s most distinguished artists, our aim is to recreate his works with impeccable accuracy and superb quality. Our painters have thoroughly studied all of Van Gogh’s techniques such as colour mixing, impasto, ambience, rhythm of application, and brush strokes. When Van Gogh decided to set out on his journey to create an identity for himself, he took a look at other artists who took inspiration from flowers, such as Jeannin with his peonies, and Ernest Quost with his hollyhocks. With this in mind, and the fact that sunflowers were in season at that time, Van Gogh decided to create a series of paintings with the central theme being sunflowers. 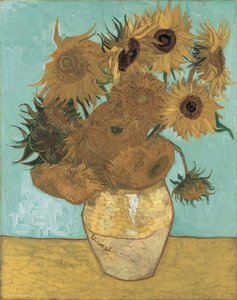 In the beginning, his work was done with sunflowers laid on their side, but afterwards, he used them in vases. 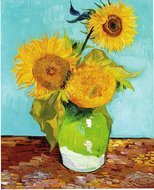 While his sunflowers were among his most famous works, little was known of the artist while he was actually painting them. During the period of 1886-1888, he lived with his brother in Arles. It was only during the spring of 1889 that it was even known that he was painting sunflowers. Around this time was his feud with his close friend Gauguin, who wanted one of the Arles sunflowers so that he could be compensated for the studies he left behind in Paris. This angered Van Gogh, since he believe that Gauguin didn’t have a right to make that request.